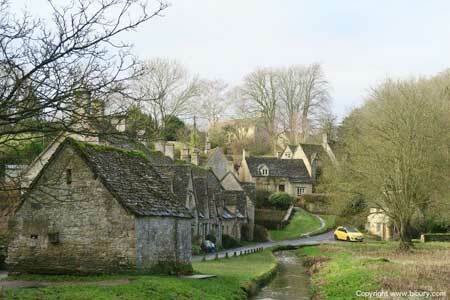 Bibury is a charming, typically Cotswold, village just a short drive from "The Capital of the Cotswolds", Cirencester. Bibury was once described by William Morris (1834-96) as "the most beautiful village in England". In fact, Fox News says that Bibury is one of the world's most picturesque villages, and an article on the Huffington Post website (1st May 2014), titled "The Most Charming Towns In Europe You'll Want To Visit ASAP", mentioned Bibury. And the cottages of Arlington Row are often referred to as the most photographed and beautiful cottages in the country. Even more so when they are "photobombed" by a little yellow car! 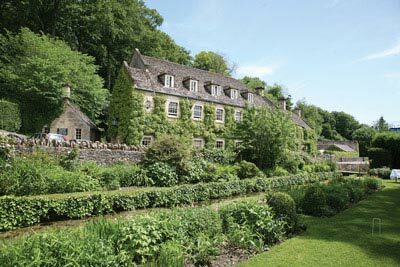 To see more photos of Bibury, visit the Bibury Photos page. Attractions and things to see in Bibury include Arlington Row, a row of weavers cottages built of local stone next to the River Coln, the Bibury Trout Farm and the Saxon Church, the Church of St Mary. The north Chancel wall of the Church is home to a stained glass window which was designed in 1927 by Karl Parsons and was featured in the 1992 Christmas stamp set issued by the Royal Mail. The River Coln flows through Bibury sandwiched between the main village street and an expanse of boggy watermeadow known as Rack Isle. 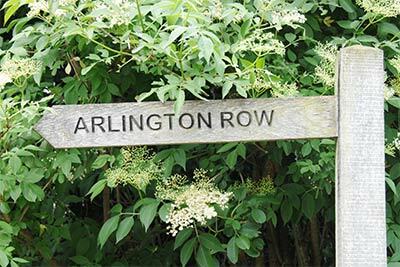 With Arlington Row as a backdrop, it makes one of the most picturesque scenes you will find in the Cotswolds. 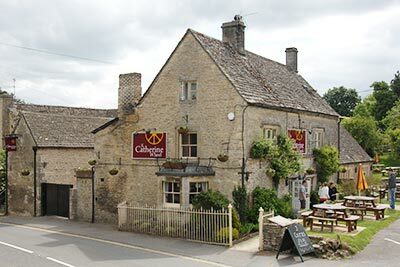 Using the links above, you can navigate around this web site to find information such as Bibury accommodation, places to eat in and around Bibury and car parks in Bibury. You can also find Bibury information on the Cotswolds Web Site. The design, concept and content of this Bibury web site is the intellectual property of Commatic Limited (herinafter known as 'Commatic' and/or 'Us') unless otherwise stated. No part of this web site, including images, graphics and text, may be reproduced or stored, in any manner, without prior permission. Much of the photography on this Bibury website is owned by Commatic, and no photos or images may be reproduced without obtaining prior written permission from Us. Information stored on this site, or collected by it may be subject to Data Protection Regulations. The nature and content of information stored about a company or individual will be disclosed on request of the individual or company concerned. Email addresses provided to the Bibury web site via email or contact such as a messageboard entry sent to this web site may be used to inform you of updates to this site, or the services provided by Commatic. If you do not wish to receive such email, please let Us know by sending an email with the word 'remove' in the subject line.